Back to School: We hope our staff and pupils have had a good summer break. The holidays are very important for our families from all over the world as it is the only time they get to see Grandparents and family. This vacation time off gives both children and teachers time to be refreshed. We are so proud of our four schools, St Bede’s and St Bernadette which have recently federated. La Retraite which has almost 1000 girls has been judged outstanding by OFSTED. The Laurels has a unique Catholic ethos and at the heart of the building is the Tabernacle which is much visited by the girls and the staff. Pray for our schools that they may transmit the treasure of the faith to the next generation as Western Europe becomes increasingly secular. We are becoming a spiritual desert with fewer conversions, declining Mass attendance, fewer vocations and fewer marriages. However you and I must stand up and make a difference. We ask Our Lady to obtain for us the grace to make this desert bloom! Change of Latin Mass Time - Mondays only: Starting tomorrow we will be changing the Latin Mass to 10am for a trial period. All other weekday Latin Masses will remain at 7am. Fr Pawel's Farewell – Sunday 24th September: Fr Pawel will return, God willing, from holiday late on Monday 18th and will say goodbye to the schools and UCM in the days following. 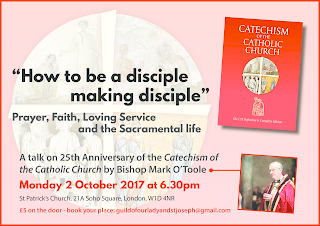 On the weekend of 23rd/24th, he will speak at each Mass and we will have our parish farewell in the context of a shared lunch. Shared Lunch – Sunday 24th: This is to say goodbye to Fr Pawel and we will start at 12.30 with a buffet. Please sign up on the lists in the porch for the food/bottle you can prepare/bring. 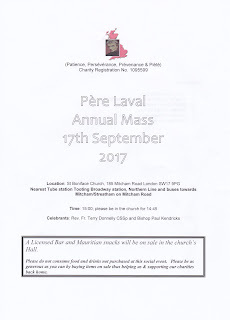 Mon 11th: Change of Latin Mass time. 7.30pm Bazaar Meeting. Fri 15th: Fr Przemyslaw Zgorecki arrives! Sun 17th: 9.30 FHC Reunion Mass. 11am Special Sunday with ‘Cantores Missæ’. Mon 18th: Fr Pawel returns. Thurs 21st: UCM farewell Mass for Fr Pawel. 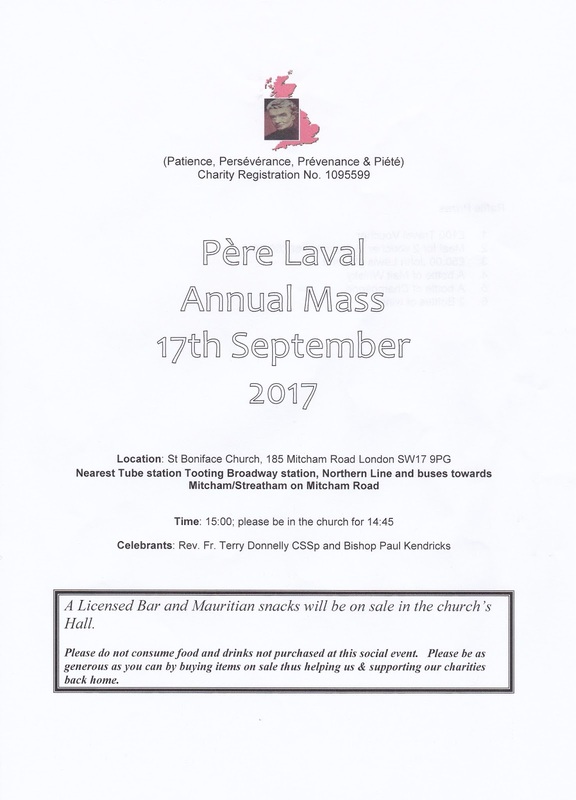 Sat 23rd: Latin American Mass & farewell to Fr Pawel. Sun 24th: Fr Pawel to preach at all Masses - shared lunch & presentation at 12.30. 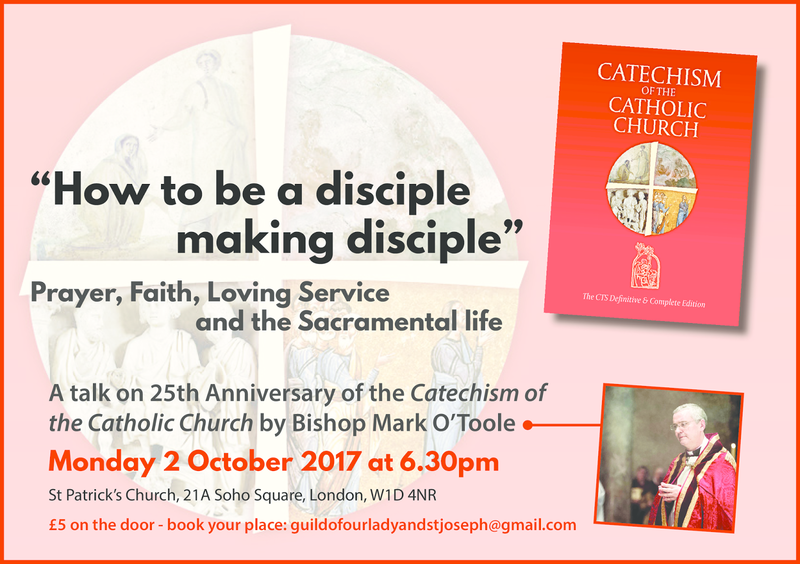 Mon 25th: Fr Pawel to go to Maidstone. Thurs 28th: 11am Pontifical Mass celebrated by Abbott Philip Anderson of Clear Creek, Oklahoma. Cleaners this week: Vicki Sabatini & Fernanda Rodrigues. 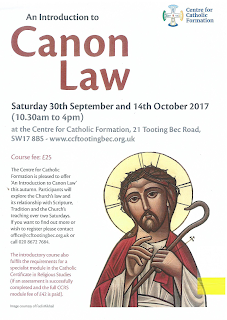 CCF Course: An Introduction to Canon Law: Sat 30th Sept & 14th October at the Centre for Catholic Formation, Tooting Bec (Cost £25.) Participants will explore the Church’s law and its relationship with Scripture, Tradition and the Church’s teaching over two Saturdays. Contact office@ccftootingbec.org.uk or 020 8672 7684. 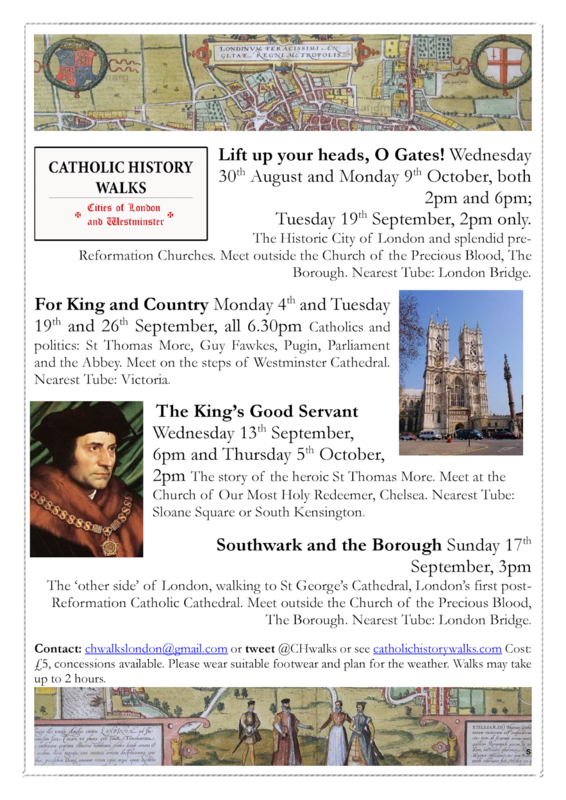 Catholic History Walks in London September / October 2017: in and around London. See poster for more information.